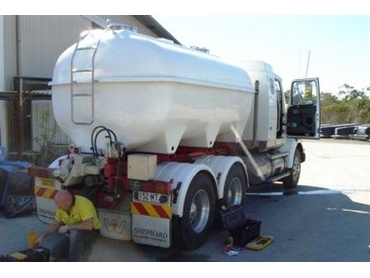 Onboard truck scales were recently fitted to a truck and trailer combination in Queensland’s Wide Bay to warn the driver if either unit is exceeding its rated Gross Vehicle Mass. Installed by Accuweigh’s Brisbane branch, the onboard truck scales comprise two separate onboard weighing systems connected to two, dual channel digital weight indicator mounted in the cab. Two dual channel weight indicators were required to enable the onboard truck scales to display the individual axle group weights of the different axle groups for both the truck and the trailer. Due to the different types of suspensions fitted to the truck and trailer, Accuweigh installed a PM Onboard truck weighing system using a combination of air bag and spring suspension weight sensors. As well as warning the driver of overloaded axles during loading, these onboard truck scales also allows product to be accurately augured out of the truck and/or trailer by weight. Both onboard weighing systems can be selected to display the weight of each axle in either gross or net weight modes to suit both loading and discharging operations. The two digital weight indicators were mounted in a stainless steel Rittal enclosure at the rear of the truck in clear view of the driver when loading and discharging product. The first onboard truck scales separately monitors the steer and drive axles of the truck while the second onboard scales display the individual weights of the front axle and rear axles of the dog trailer. Accuweigh is the exclusive Australian distributor of the UK based PM Onboard range of onboard weighing systems. Accuweigh’s eight branches across Australia ensure full after sales support is available in all mainland states by experienced service staff.